The art part of quilting came more easily to me when I read Sally Terry‘s book Pathways to Better Quilting and learned about the five shapes…. in different combinations? Look at a line drawing or quilting design you want to reproduce and analyze it by breaking it down into the shapes that apply. Repeat the shape names to yourself as you quilt/draw the design. Understanding this simple concept will give you the courage to try complex shapes without marking. It was a major breakthrough for me. 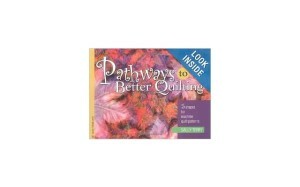 “Pathways to Better Quilting,” by Sally Terry.